I purchased this wheel at an auction thinking that it was a walking wheel missing a lot of parts, which is probably what the auctioneers thought, and why it was so inexpensive. I originally thought that it would look cool in the window when we were just opening the yarn shop about 5 years ago. I briefly thought about setting it outside to draw people in until I realized how unusual of a wheel it was. 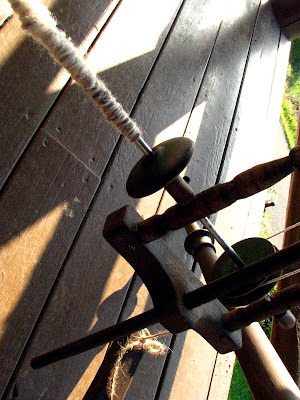 It did on occasion stop traffic when some spinning fanatic caught a glimpse of it in the window and realized a fiber shop was calling. I realized that it was missing a treadle and the quill or spindle that the yarn would wind onto, and I recently decided to get it restored. 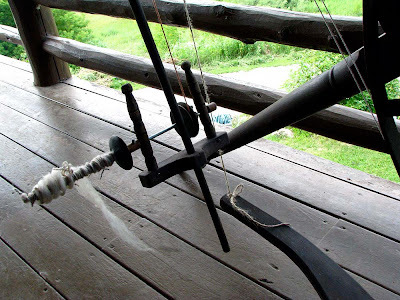 One of my former spinning students’ father-in-law repairs spinning wheels, so I gave him a call. Wilmer Homstad turned out to be this interesting old (upper 80’s) guy who had never seen a wheel like this. Although he couldn’t promise anything I could see a twinkle in his eye that told me that he was intrigued enough to give it a shot. I told him there was a complete wheel to look at, at the historical museum here in Viroqua and showed him a couple of pictures I had pulled off the internet. A couple of weeks later he called and said that I should come and talk to him about the wheel. I figured he was giving up but when I got there he had it all together and was just scratching his head because he couldn’t figure out how it was supposed to spin. After getting it home and at first failing miserably I finally had an aha moment when I understood how it is supposed to work. Still a long way from making it a reality though! This wheel brings back my long ago beginner spinning days when you feel like you are all thumbs with two left feet. 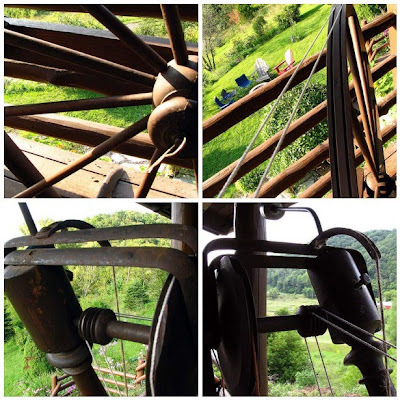 After some research, I believe that this wheel is a Lyman Wight pendulum wheel (patent 1856) and possibly manufactured by Justin B. Wait in Waitsville, Wi. between 1862 and 1871. In the way of all men who look at wheels and try to make them better he was trying to improve on the walking wheel by being able to spin sitting down. Sheep in Wisconsin at this time were a merino type, with very fine and short stapled fiber which I can see this wheel would excel at. However after attempting to use this wheel I believe this design falls in the dud category and from what I have read not many were made. Granted that my wheel is older than dirt and super wobbly (athough lovingly restored) that whole pendulum swinging away from you ,pulling the thread out while you are using your hand to turn the wheel and get twist into the fiber, involved more coordination than I was able to muster in my one session with it. 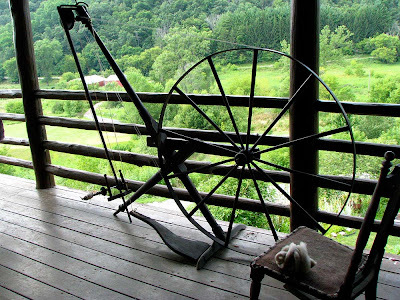 I would like to see a less rustic version to see how it spins. I have included a video of someone else who actually knows how this wheel works, because it is just too hard to describe well. I do know that I am very glad to have my Schact wheel, that spins effortlessly and doesn’t threaten to stab me in the face with a swinging pendulum. This is so fascinating, I have never seen or heard of anything like that! And it looks very complicated to spin on. Thank you for this interresting post! The beauty and history of it make it well worth keeping around, but keep yourself at a safe distance. Wow! that is fantastic! I have never seen a wheel like that before. i recently purchased a pendulum wheel, is there any detail that can help determine the maker? you mentioned how you think the maker of yours. is there some look to the wheel or pendulum, etc. that helped? Hi Christine, sorry I am not enough of an expert to help you there.